A simple three-note melody is quietly sounded out as electronics buzz and swarm their way into the foreground, a low tone gently swelling in the back. A bird cries above, water sloshes lightly in the harbor. What is conjured up is not quite bliss, but something more ecstatic, outside-of-itself while still being very rooted in a particular place, a particular moment and a particular individual’s perceptions. This bliss is mournful but complacent, a sort of melancholia for the Millennials. There is pleasure to be had, but I suspect that at times it is pleasure taken from pain. Bliss, the latest solo album from Italy’s Luca Sigurtà– whether one experiences bliss or not- is still a compelling emotional journey of a soundscape. Luca Sigurtà has been releasing music for over a decade now, perhaps most well known for Harshcore, his duo with Tommaso Clerico. Sigurtà also performs with the psychedelic/drone group Luminance Ratio and has released about a half dozen albums collaborating with many figures from across the Italian experimental scene, including Matteo Uggeri, Claudio Rocchetti, Fhieval, and the Meerkat collective. There is a strong aesthetic of arte povera (poor art) at work in all of Sigurtà’s music, an ability to produce beautiful work using cheap or easily accessible materials. To my mind this is in many ways the dominant mode of Italian creativity in general, even though the Modern art movement arte povera was initiated in the ‘60s. Look to the tradition of Italian cooking, for instance, which creates rustic dishes composed of a few good ingredients that are in season, shifting the emphasis towards resourcefulness and refined technique. Similarly, Sigurtà uses field-recordings, tape loops, analogical sources and various electronic junk as the raw material for his compositions, crafting them into coherent and unified spaces. These modest materials are impressively sculpted to produce powerful rhythms and soundscapes that uniquely convey aspects of modern life. Bliss marks his first solo release since 2004’s la vera macchina d’argento (the real silver machine), and is something of a departure for Sigurtà. He explores more contemplative and perhaps lethargic aural avenues than we’ve seen in the past, less rhythmic and more dreamy. Sigurtà’s straddles the gap between noise and silence in a way that leaves just enough room in these compositions to disorient the listener. Silence plays an important role, giving one time to perceive something that has already passed. A slight sense of foreboding permeates the record, as if one can’t quite let ones guard down even when basking in the sun, a distant storm beginning to rumble in the distance. Dreamier and relatively quiet, events unravel as a steady pace, establishing a mood and exploring it rather than traveling through a narrative framework. 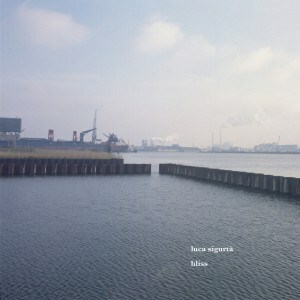 The field-recordings and cover image come from time spent in the harbor in the northern part of Amsterdam. Though the material is open to interpretation, this site-specific aspect grounds an otherwise surreal soundscape. The blissful aspects are most evident on “2”, as the melody bounces slowly around as the harbor sleepily lulls us into a state of peaceful contemplation. Many people find being near the open sea to be soothing, though others are made anxious. Bliss may have a similarly polarizing effect on listeners. One has to be a patient and willing to be drawn into these spaces.